We have already discussed what interest is. We learned how to use the formulas for simple interest, compound interest, and sum of annuity due. Unfortunately, the situations that these formulas describe are unrealistic. Most of the time loans do not begin with an initial amount (principal) and then nothing else happens as interest grows. In real life people have to make monthly payments for morgages and credit cards. Saving for retirement seldom involves repeatedly contributing exactly the same amount. In other words the formulas are normally tools we use to in parts of a more complex situation. They are not usually answers all by themselves. Remember the table we made about six years of increasing rent? Some real life situations require tables. There is no place for the simple and compound interest formulas to help. 1. Geoffrey Crayon buys a $3,000 computer. To keep his bookkeeping simple, he starts a new credit card that charges 22% annual interest per year (compounded monthly) and will use the card for nothing else. Geoffrey pays $400 per month until the balance is paid off. Finish the table below to find his total interest in dollars. 1. Lots of numbers! Work is done on a Google spreadsheet. The total interest is $193.80. You can also save your own copy of that spreadsheet and try fiddling with the starting balance, monthly interest rates, or other values to instantly see how the total interest changes. 2. Express Geoffrey's total interest as a percentage of the computer's cost. Geoffrey's problem was a bit long and unpleasant. Unfortunately, real life can be even more complicated! Here is a practical situation that involves interest in subtle ways. 3. Fendrick wants to buy a new dining room set for $900. He is considering four methods of payment. After looking at his budget as well as his actual expenses for the past few months, he thinks he can save $80 per month towards this purchase. He has four options, described in detail on the table below. Which option is best for him? He could pay cash up front if he waits almost a year, but he would prefer not to wait that long. He could use the furniture store's normal installment plan that has a $100 downpayment and then a 15% annual interest rate. He could use the furniture store's special zero down plan with an 18% annual interest rate. He could open a new credit card with a 22% annual rate. 3. Lots of numbers! Work is done on a Google spreadsheet. Saving up to pay cash up front is of course the least expensive. It has $0 interest! But that might not be what makes Fendrick happiest. 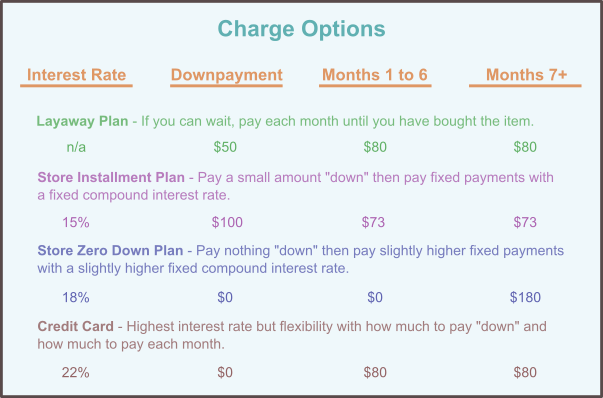 If Fendrick cannot get together the $100 downpayment then he pays significantly less total interest for the credit card ($81.75) than the zero down plan ($118.83). Fortunately, retail markup is a straightforward application of percent sentences. We can even save a step with the one plus trick. Unfortunately, retail markup is also confusing. This is because stores disagree about which value (wholesale cost versus retail selling price) is the "original" amount. The information provided must match, unless we get involved with more algebra than is used in this class. A store that bases markup on wholesale cost must also know the item's wholesale cost. A store that bases markup on retail selling price must also know the item's retail selling price. First consider the stores that use markup on wholesale cost. In their mindset, they purchase their goods at an "original" wholesale cost. They go up that baseline wholesale cost enough to sell retail with an acceptable profit. 4. A store uses a 40% markup on wholesale cost. What is the markup in dollars for an item with a wholesale cost of $100? What is the retail selling price of that item? 4. In this case, markup answers the question "What is 40% of the wholesale cost?" Next consider the stores that use markup on selling price. In their mindset, they look how to price goods competitively and then from that "original" competitive retail price work to find an affordable wholesale supplier. They go down from that baseline retail cost enough to purchase wholesale with an acceptable profit. 5. Another store uses a 40% markup on selling price. What is the markup in dollars for an item with a retail selling price of $100? What is the wholesale cost of that item? 5. In this case, markup answers the question "What is 40% of the retail price?" Notice that the markup was the same dollar amount in both examples. In one case we added the markup to the wholesale cost. In the other example we subtracted the markup from the retail price. We were using two different kinds of markup appropriately. First we were told the wholesale cost and that the markup is based on that wholesale cost. Second we were told the retail selling price and that the markup is based on that retail selling price. Remember that our math does not work if we try to use markup inappropriately. Consider the problem "Sam works at a jewelry store that uses a 40% markup on selling price. His store ordered a necklace for $1,250. For how much should he price the item?" None of our formulas apply, since we know the wholesale cost but are asked to use a markup on selling price. The use of retail discount is easier because there is no confusion about what value is the "original" amount. The original price is the older, before the sale, more expense price. Discount is again a straightforward application of percent sentences, and we can save a step with the one plus trick. 6. A toy originally selling for $80 is put on sale at 15% off. What is the new cost? Find the discount, then subtract it from the original cost. 6. We ask, "What is 15% of $80?" Because we are subtracting to find a smaller number, we change the one plus trick into a "one minus trick". 7. A toy originally selling for $80 is put on sale at 15% off. What is the new cost? Find the new cost in one step using the "one minus trick". 7. We ask, "What is (100 % − 15%) of $80?" A more complicated situation is a chain discount, when more than one discount applies. 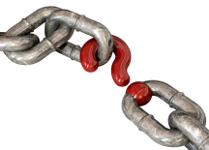 We use the "one minus trick" for each link in the chain, to consider what remains after each price reduction. The end result of a chain discount is called the single equivalent discount rate. 8. A toy originally selling for $80 is put on sale at 15% off. Then that selling price is reduced another 20%. Then a coupon cuts the price another 10%. What is the final cost? 8. We change each of the three discounts into a percentage remaining after that discount. What about if we know the single equivalent discount rate, but are missing one of the links? 9. A toy originally selling for $100 is put on sale at 15% off. A store-wide seasonal sale cuts the price another 10%. The store expects the toy will only sell if the price is lowered to $60. What additional discount should be applied with a special coupon? 9. We change each of the two discounts into a percentage remaining after that discount. So the formula becomes $100 × 0.85 × 0.9 × r = $60. This becomes $76.50 × r = $60. Divide both sides by $76.50 to find that r ≈ 0.78 = 78%. So the missing link has 78% remaining. The store should apply 100% − 78% = 22% more discount with the coupon. There are two ways restaurants define "cost per plate". Both take into consideration that feeding a large group of people includes many expenses other than what the food costs. In fact, these other expenses (labor for cooking, serving and cleaning, material costs for cleaning before and after the meal, cost of the room, etc.) usually make up more of the meal's cost than the food. 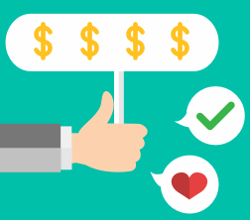 The desired profit method estimates the other costs as dollar amounts, sums these costs, and then uses a scale factor to increase that total to make a profit. Traditionally the profit is 10% to 15%. Because we want the total cost per plate (not merely the profit per plate) we use the "one plus trick". 10. A restaurant meal that serves four has $32 food cost, $60 labor cost, and $15 other cost. Find the price per plate according to the desired profit method with a 10% desired profit? 10. Use the formula for the desired profit method method. 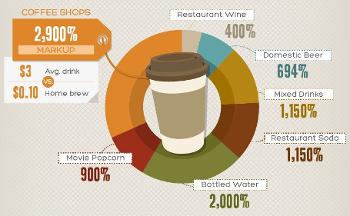 The food cost percentage method estimates that the food costs are 25% to 30% of the total expenses. This percentage is used as a scale factor to determine the cost per plate. Notice that the scale factor was stated as an amount to scale down (for example, "of the total cost 25% was the food"). But we want to use it "backwards". So, as with the produce yield percent, we divide instead of multiply. 11. A restaurant meal that serves four has $32 food cost, $60 labor cost, and $15 other cost. Find the price per plate using to the food cost percentage method with a 30% scale factor. 11. Use the formula for the food cost percentage method. 12. Grace works at a store that uses a 40% markup on wholesale cost. She orders an item for $90. What will the markup be in dollars? markup in dollars = wholesale cost × markup rate = $90 × 0.4 = $36. 13. Grafton works at a store that uses a 30% markup on wholesale cost. He orders an item for $200. For how much should he price the item? retail selling price = wholesale cost × (1 + markup rate) = $200 × 1.3 = $260. 14. Gavin sees that an item whose selling price is $240 has a 40% markup on selling price. What is the dollar amount of this markup? 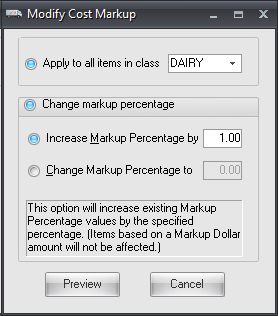 markup in dollars = retail selling price × markup rate = $240 × 0.4 = $96. 15. Georgina works at a vitamin store that uses a 75% markup on selling price. She needs to stock a certain bottle of vitamins for no more than $3.50. How much can she allow a supplier to charge her store for this bottle of vitamins? wholesale cost = retail selling price × (1 − markup rate) = $3.50 × (1 − 0.75) = $3.50 × 0.25 = $0.87. 16. Galina has a clock that cost her $62.50. She wants to sell it online for $102.50, for a profit of $40. What is the markup rate if measured as a markup on wholesale cost? What is the markup rate if measured as a markup on selling price? 16. The markup rate if measured as a increase from the cost is $40 ÷ $62.50 = 0.64 = 64%. The markup rate if measured as a decrease from the selling price is $40 ÷ $102.50 = 0.39 = 39%. 17. Ginger works at a sporting goods store, and knows that a certain kind of skis will only sell if it is priced $109.95 or less. Currently the price is $120. What percent discount is needed? 17. The change is $120 − $109.95 = $10.05. So the discount rate is $10.05 ÷ $120 = 0.08375 ≈ 8%. 18. Grant buys a jacket. What a great deal! It normally cost $275, but there was a store-wide 20% off sale and he was also able to use coupon to reduce that sale price another 15%. How much did he pay for the jacket? 18. The final price is $275 × (1 − 0.2) × (1 &miuns; 0.15) = $187. 19. Geoffrey works at a candy store. He knows from past years' experience that after Valentine's Day he needs to reduce the prices of the special $30 chocolate boxes down to $18 to clear out that inventory. He uses a store-wide sale of 10%, hoping that will attract customers. He also distributes a coupon that further discounts the sale price of those expensive chocolate boxes. What percent discount is needed on the coupon? $30 × (1 − 0.1) × r = $18. Combine the first two numbers to get $27 × r = $18. Divide both sides by 27 to get r = 67%. Since that is what should remains after the coupon decreases the price, the discount should be 100% − 67% = 33%. 20. A restaurant meal that serves six has $50 food cost, $70 labor cost, and $25 other cost. Find the price per plate using to the desired profit method with a 10% desired profit, and then with the food cost percentage method with a 30% scale factor. Here is a Math 20 review problem about SI unit conversions. Each time you load the page the problem changes! 29. A store uses a markup on wholesale cost of 25%. They buy an item from their supplier for $45. What retail selling price should they use when trying to sell this item? 30. A store uses a markup on retail selling price of 25%. They know an item can sell if it is priced at $450. What wholesale cost must they find if they want to stock this item? 31. An item that normally sells for $60 is on sale for 12% off. Then that sale price is reduced by another 20%. What is the new sale price? 32. A restaurant meal that serves 4 people has $28 food cost, $31 labor cost, and $18 other cost. What price per plate should the meal be assigned according to the desired profit method with a 12% desired profit? 33. A restaurant meal that serves 4 people has $28 food cost, $31 labor cost, and $18 other cost. What price per plate should the meal be assigned according to the food cost percentage method with a 20% scale factor? 34. Write a paragraph that compares the three charge options. What was the advantage of the installment plan with $100 down? What was the advatage of the zero down plan? What was the advantage of using a credit card? Which of these plans had a big disadvantage? 35. A store puts an item on sale using a chain of three discounts. The first two discounts are 15% and 25%. If the desired single equivalent discount rate is 40%, what should the size of the third discount rate?